Summary : One of Italy's more unique pizza places, this counter shop serves creatively filling pies (like one I tried with port wine sauce). Away from the central tourist area of Rome, a visit here makes for a nice getaway lunch trip. Although I had some great food while eating my way through Rome, pizza was not one of the highlights of the 36 hours I spent there. I was underwhelmed with the pizza at Dar Poeta and an impromptu stop at Forno Marco Roscioli didn’t fare well either. If I’d had the opportunity to truly explore Rome’s pizza scene, I know I would have found some gems. 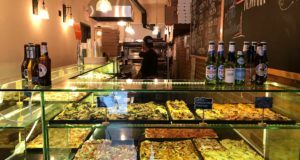 Before taking off, however, I was able to squeeze in just one more place, and I decided to venture outside of Rome’s tourist area to a new and innovative pizza shop in the Testaccio neighborhood called 00100 Pizzeria (88, Via Giovanni Branca, 39-06-4341-9624). It’s located less than a 10 minute walk from the Piramide metro station — easily accessible, but away from the hustle and bustle of the city center. 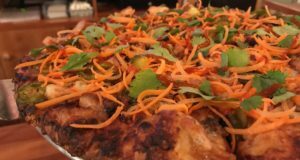 I was particularly interested in trying 00100 Pizza because it was featured in a recent New York Times article (36 Hours in Rome)… and since I’d eaten so much traditional pizza during the course of my trip, I was looking for something a little daring. The place served the most unique and creative pizza I had in Italy. And although I have no authority to crown it Rome’s best pizza place, it was certainly the best pizza that I had there. The spot itself is tiny. Inside you’ll find a couple of bar stools, but most people just order their slices to go. There are two benches outside and a park down the block where you can enjoy your pizza. So as long as the weather holds up, your best bet is to take a stroll. When we arrived at the pizza place, the man behind the counter began speaking to us not about the pizza, but rather about another food item which 00100 Pizza specializes in: the Trapizzino. The shop claims to have invented this food (any mention of it on their website is followed by an ®) which is a combination of the words “tramezzino” (sandwich) and pizza. In reality, it doesn’t resemble pizza. It’s more like a triangular bread pocket with a filling. We were handed one with meatballs. The Trapizzino was tasty, but I didn’t want to overindulge — as my focus was on the pizza. But if you’re hungry it’s definitely worth trying. They come in two sizes: a small is €3.00 (about $4.00) and a large is €5.00 (about $6.50). If you just want to try the bread you can get them “vuoti” or “empty” for €0.50 and €1.00, respectively. That might not be a bad way to go as the emphasis at 00100 Pizza is on their bread. It’s soft, thick, and chewy, and serves as a strong base for their creative pizza pies. They had five different pies on the menu when I was there. Although whole pies can be made to order, their square slices are reheated. I decided to order Margherita slices and Greenwhich slices. The latter contained Stilton cheese (a blue English cheese) and mozzarella. After coming out of the oven, a port wine sauce was drizzled on top. It was flavorful and delicious. I can’t recall having ever tried a similar pizza, especially given the perfect crust which the cheese adorned. It was the highlight of my trip to 00100 Pizza. A full pie will run you a whopping €25.00 (about $34.00), but it’s sizable and filling, as you can see below. Our slices — which were priced by weight — came out to €3.85 (about $5.50). The Margerita pizza was also quite good, although that was in large part due, once again, to the great crust. It almost tasted like a Sicilian pie baked on a bread with focaccia-like properties. As you can see below, the cheese took precedence over the sauce. An entire Margherita pie costs €16.00 (about $22.00) and our slices were €3.30 (about $4.00). Another pie on the menu that looked appetizing contained potatoes and pancetta. But perhaps the most outrageous one was a pie called In Bocca. The man working there claimed that it consisted of ham, cheese, and salvia. Yes, salvia. You probably know salvia as a psychoactive plant that can, as Wikipedia puts it, “induce dissociative effects and is a potent producer of hallucinatory experiences.” From what I can tell (and I’m no scientist), salvia’s active constituent (salvinorin A) becomes deactivated when orally ingested. 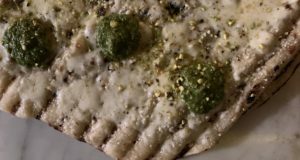 You’d probably have better luck getting high off of poppy seeds. On my way out, I noticed something that every pizza place in Italy is lacking — a solid beer selection. Although it’s common to pair pizza and beer together in Italy, it is rare for pizza places to offer quality beer. Peroni is the extent of many beer lists I came across. Had it not been noon, I would have grabbed a beer to go. 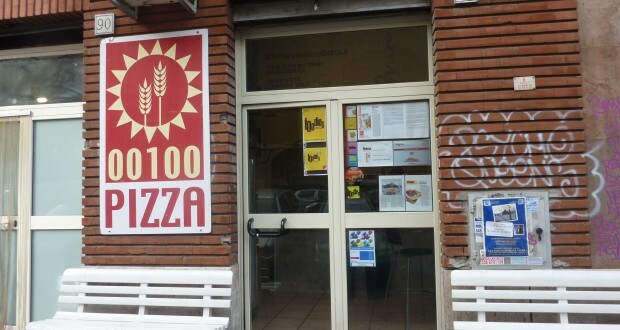 But every trip to 00100 should include not only their cutting edge pizza, but a carefully selected bottle of the best beer you’ll come across in Rome.